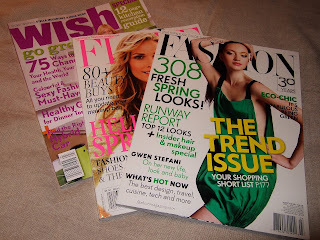 While in Vancouver this past weekend, I picked up a few Canadian magazines - Wish, Flare, and Fashion. These are great to browse through for sewing inspiration. 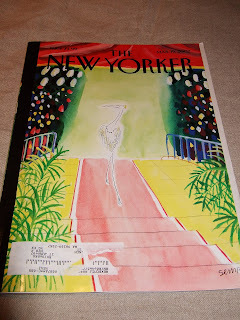 I'm just getting around to reading the March 19 issue of the New Yorker that came last Friday. It's the annual style issue and includes an articles on cracking down on counterfeits, secondhand/vintage shops in LA, and the fascinating man currently behind the Chanel label, Mr. Karl Lagerfeld. 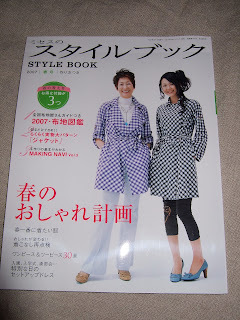 And finally, some discussion on the Pattern Review message boards prompted me to buy a copy of the Japanese pattern magazine, Mrs. Stylebook. In order to make the patterns, you've got to design a sloper first, then make adjustments off that to create the designs. There are also pattern pieces included for tracing but I haven't opened those up yet to see what they are. I don't know if I'll actually make anything from this magazine, but it's certainly interesting to check out!